Back to negative square one | Katima-what? Notes: Weight fluctuates between 2 lbs day to day, so this could just be a day when it’s really low… I hope. I’m 2 pounds lower than my starting weight! At least I’m 5 years younger again. I use a male trainer, but on my first exercise of the day (Single-Leg Extension), the female trainer filled in. How odd. Anyone know why this happened? I unlocked 20 reps of the Single-Arm Stand which I’ll start tomorrow, along with what I unlocked yesterday. Holy crap! My Wii-Fit bank turned bronze (because I have a total of 10 hours accumulated in exercise)! It’s so shiny. Best Exercise: Arm & Leg Lift. I bought a book down with me while I was doing the exercise and the time just flew by. The trainer tells me when my arm is dropping or going too high, so it’s the perfect solution. Worst Exercise: Single-Arm Stand. I don’t get it. Is the game trying to measure if I can keep my balance with the blue line, or is it trying to keep my arm pointed straight in the air without it shaking? I think it’s the latter. 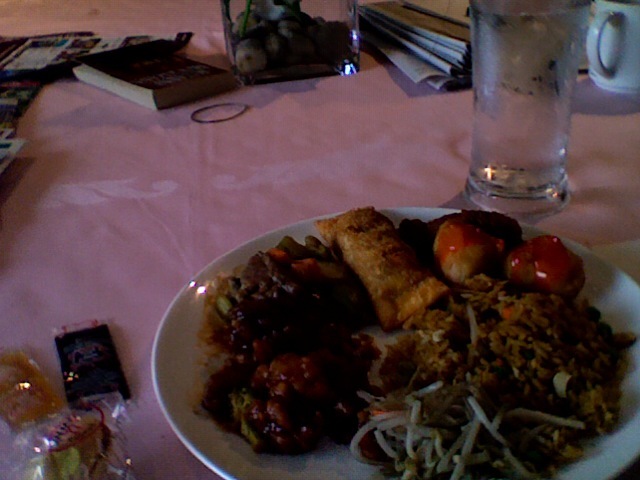 (Starting clockwise from top) Egg roll, 1 drumstick (bad quality photo, behind the chicken balls), 2 chicken balls with sweet and sour sauce, chicken fried rice, chow mein, General Tao’s chicken, Beef stir-fry, a glass of water, 1 packet of plum sauce and soy sauce respectively, and a fortune cookie for Lunch. I didn’t know how I was going to make Chinese takeout healthy, but I figure if I have a bit of everything, it shouldn’t be so bad. Plus I could use the weight gain according to Wii-Fit. Forecast for dinner will be Lemon-Pepper crusted cod with bell pepper stir-fry and water, of course. I lied, it was actually chicken fried rice with a bit of General Tao and a can of Arizona Fruit Punch. Hopefully tomorrow’s lunch and dinner will be better. Right now the forecast is rain, which we desperately need. I was called back into work tomorrow, so this is my only day off… and it’s raining. I’ll just take the good with the bad. Oh right, my fortune: “You are a practical person with your feet on the ground”… in bed. Enh, that doesn’t work quite so well. i kept saying i wanted to do exercise but never did though the park is just beside my condo. what a hypocrite i am. Seriously, the hard part is getting started. Now that I’ve done it for a few days, it’s starting to feel less like a chore and more like something I just do.